It's one minute to midnight, do you know where your socialized medicine is? Do you want to know? I don't, that's scary! Two women, two dysfunctional relationships, but one was understandable . . .
. . . the other was a gimp. "In 1996, two young, ambitious women worked at the Clinton White House. One was assigned to the West Wing—the presidential wing—and became known for her stained blue Gap dress, a sordid manifestation of Bill Clinton’s baser appetites. The other served in the East Wing, where the first lady’s offices are situated. This is the story of the second one, whose selfless servility and uncanny knack for predicting what the boss wants have put her closer than almost anyone to the most powerful woman in American politics." This makes Huma sound so normal, so reliable, so efficient. "'She was a very, very religious person—she didn’t smoke, drink or swear, always very polite,” recalls one Clinton friend, who, like most people who spoke to Newsweek, asked not to be named. “A lot of times, Hillary would snap her fingers and go, ‘Gum.’ And Huma would fetch it.” Abed in took her duties so seriously, the source recalled, that when she learned that Clinton had once carried her own bag up a flight of stairs in her aide’s absence, Abedin nearly burst into tears." Then we find out she was none of those things, she is a gimp. What kind of person would intentionally become Hillary Clinton's gimp? No one expects the Spanish Inquisition . . .
. . . but we all should, environmentalism, and progressivism are becoming a metastasizing evil religion, which can only end in something ugly, and deadly. Environmentalist want to kill you . . .
. . . no, not metaphorically. "Why does the green movement oppose every practical form of energy? There is only one answer that can explain this. Greens oppose every practical form of energy not out of love for the non-existent virtues of solar and wind energy, but because they believe practical energy is inherently immoral." This is the logical end of holding human nonimpact as your standard of value; the best way to achieve it is to do nothing at all, to not exist. Of course, few hold that standard of value consistently, and even these men do not depopulate the world of themselves. But we need to depopulate the world of their ideas. Our goal should not be the impossible idea of a form of energy that doesn’t impact nature but the form of energy that most benefits human beings. We don’t want green energy we want life-enhancing, humanitarian energy." I am about at the end of my rope with these losers. They have been wrong about everything. They believe nonsense, hate humans, themselves, and are intent on carrying out their childish murder fantasies. These people are staunch atheists. They are dangerous, not just silly cranks. If ever give half a chance they would take it. To the demise of millions, or even billions. the antizombie vaccine failed . . .
. . . and the cities, which were vaccinated by the 2008 Great Recession, are once again zombies, shambling towards their demise. 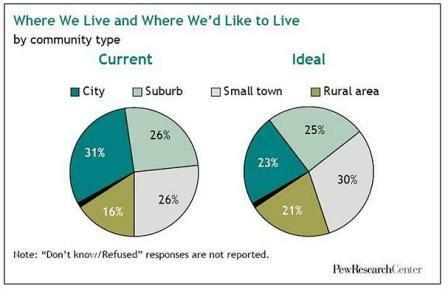 Suburbs, exurbs, and rural living, however, is back on track to become the primary American living arrangement. Good! We have returned to the pre 2009-2011 aberration where it looked like Americans might be moving back to the city. So, how big a trend is this? "These trends predate the recession. Since 2000, the biggest migration winners in percentage terms are Raleigh, Austin, Las Vegas, Charlotte, Phoenix, and Orlando. In total numbers since 2000 it’s also a familiar list, led by places like Phoenix (net gain: 705,000), Dallas-Ft. Worth (569,000), Atlanta (547,000), Riverside-San Bernardino (513,000) and Houston (496,000). The biggest losers are also familiar, led by the New York metropolitan area, which has lost 2.65 million net migrants since 2000, followed by Los Angeles (negative 1.65 million) and Chicago (down 880,000). Remarkably the two metro areas that have benefited the most from the digitization of the economy are in the loser’s column; between them San Jose and San Francisco lost over 550,000 domestic migrants since 2000." Big! The old line progressive blue model cities are losing population to the new, and much more dynamic sunbelt cities. "The other big finding from the new estimates: suburbs are back. In the wake of the housing bust it was widely predicted that the ‘burbs were doomed by high gas prices, millennial preferences and a profound shift of employment to the core cities. The New York Times NYT -0.08% evenpublished fantasies on how the suburban carcass could be carved up, envisioning suburban three-car garages “subdivided into rental units with street front cafés, shops and other local businesses” while abandoned pools would become skateboard parks. Overall domestic migration continues from the core cities to the suburbs. Over the last year core counties lost a net 185,000 domestic migrants, while the suburban counties gained 187,000." If other people are hell, then the city is hell on steroids. "These trends are likely to continue as long as the economy achieves even modest growth. One big factor will be the migration of millennials, now headed increasingly to Sun Belt cities and suburbs. Since 2010, among educated millennials, the fastest growth in migration has been to such lower-cost regions as Atlanta, Orlando, New Orleans, Houston, Dallas-Fort Worth, Pittsburgh, Columbus, and even Cleveland. Millennials are also headed increasingly to the suburbs. According to the National Association of Realtors, 80% of the homes purchased by millennials between 2013 and 2014 were detached houses, and 8% had chosen attached housing. This trend will accelerate in the next few years, suggests Kolko, as the peak of the millennial wave turns 30." Apparently the indoctrination of the Millennial in K-12 and college has not held as well as anticipated. They seem to be able to make rational economic decisions once it is their money, and not the money of their parents, or others. Expect this awakening to continue as Millennials turn to work, and begin families. These trials will result in many of the Millennials being slowly be washed of their inane love for all things socialist. Remember the older Millennials are just now turning 30. Kotkin concludes, "America’s geography will be increasingly dominated by Sun Belt cities as well as suburbs. This challenges the preferred narrative among most planners and the mainstream media, as well as some developers who believe more Americans desire to live in high cost, high density locales. Some day perhaps the facts — as seen both in this year’s numbers and longer term trends — will intrude on the narrative. Dispersion is back, and getting stronger. It’s time that developers, planners and the media adjust to the facts, rather than just reflect their prejudices." Planners will not change. Portlandia is proof that the planner will continue to believe what amounts to religious beliefs regardless of the depth of the facts arrayed against him. These are intelligent people who are sufficiently clever to trap themselves in a belief net which is impervious to reality.